As I mentioned previously, this is an interesting innovation - you pay what you want (or nothing) - in other words, a kind of 'digital busking'. So I paid, er, £0.00 the first time - and having listened and enjoyed the album I've gone and bought it again: for £6.98 (or approximately €9.99 - the going rate for albums in the iTunes shop). Plus the 45p 'handling fee'. For some reason the Radiohead website only gives you the option to specify a sterling amount. By the way - this is not the album cover, it's from a blog on ideas for the cover as the 'hard copy' version of the album is not due out until next year, and so there's a competition to design the final version. 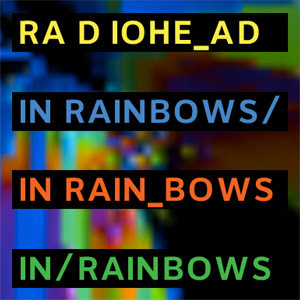 This version of the cover is a play on the InRainbows.com website.